My interest in painting slate goes back to when I was a kid in Girl Scouts. Actually, a big chunk of my love of crafting, as well as my love of the outdoors, comes from my experience in Girl Scouts. I first joined Scouts in first grade and I continued into college, at that point being the adult leading workshops for younger girls. About five years after graduating college, I was redoing the yard of the house I was living in at the time, and I remembered that my parents had a stack of old slate shingles in their shed from past Girl Scout folk art projects. I used some of that slate to create stepping stones for the garden and painted some ivy designs on them. It was then that I decided to once again recycle the slate shingle for hand-painted art. Instead of traditional ‘folk art’ designs, I chose to paint in my own style; colorful butterflies, flowers, & garden designs. The design for each piece of miniature art is determined by the shape of the slate. Larger pieces become wall-hangings featuring flowers or winter scenes. Smaller pieces become novelty magnets, little pieces of fridge art. Most recently I completed a series of four slate magnets. The largest is roughly 2" x 1.5". The smallest is about the size of a quarter. Below is the series of steps of my slate painting. After washing & drying, each slate gets a solid color background. or I get in a certain creative flow. I use images of real butterflies when painting. 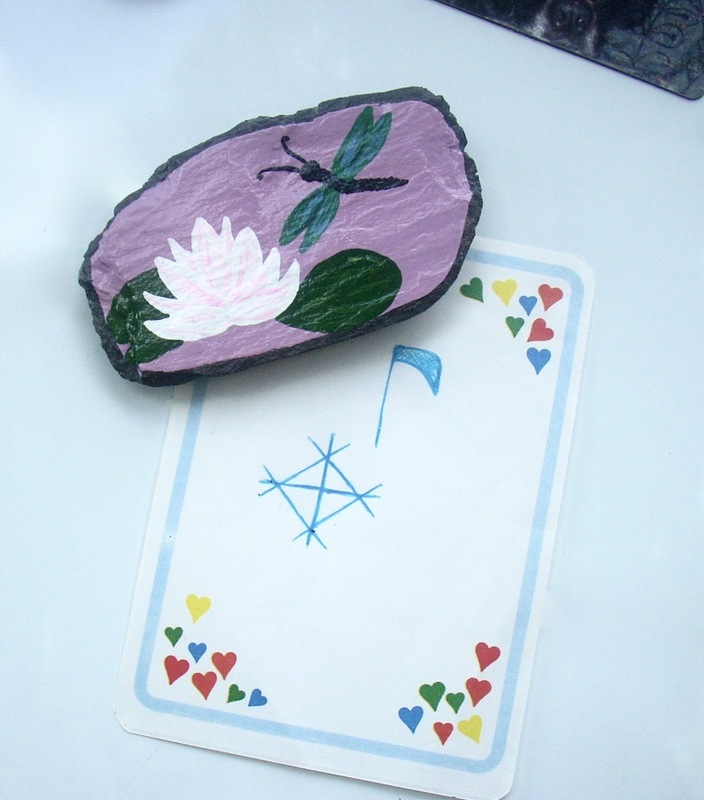 Currently, slate magnets are for sale in my Etsy shop Snowywinds Studios. Wall-hangings are currently only available at in-person events. Sign up for my email list to get notifications of events.